From A&E’s list of new and returning series this year, here isthe description of the new season of Criss Angel Mindfreak. The world-renowned mystifier takes his “Mindfreak” demonstrations to unprecedented levels with six epic one-hour specials featuring incredible illusions, death-defying escapes, fearless demonstrations and astonishing physical feats. This season Criss goes to new heights with a spectacular attempted jump across the Grand Canyon on a powerful new-age motorcycle where he will miraculously reappear in a locked cage dangling from a hovering helicopter or crash to his death. He will also attempt to walk up the side of the Luxor Hotel and Casino and combine two of his most acclaimed demonstrations when he attempts to levitate more than 400 feet up in the air and vanish. He will also attempt to pull off the largest mass vanish ever making more than 100 people disappear in the blink of an eye and recreate the most dangerous Houdini escape ever attempted hanging more than 4000 feet above the ground. 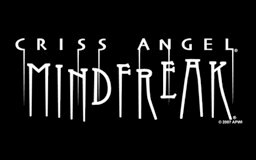 “Criss Angel Mindfreak” is produced for A&E Network by Angel Productions Worldwide Incorporated (APWI) and Baram Productions Criss Angel, Dave Baram and Erich Recker serve as executive producers. Executive producers for A&E are Robert Sharenow and Elaine Frontain Bryant. This confirms that Angel is sticking with the one hour format from last year’s Five Lives of Criss Angel.